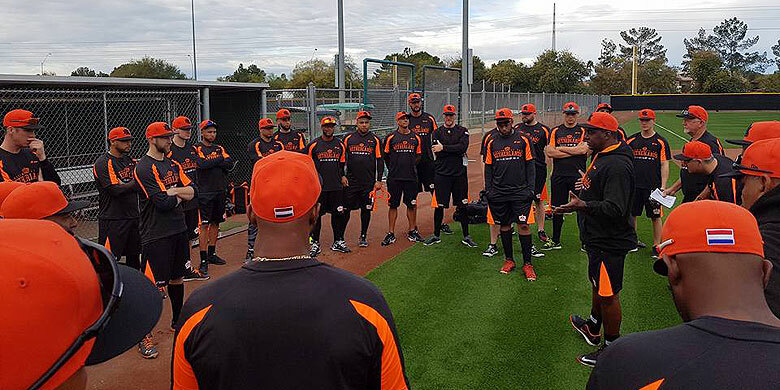 The Netherlands have opened training camp in Scottsdale, Arizona, the minor league and Spring Training home of the San Francisco Giants. The Dutch team has its own club house in the complex and can use all facilities. Their manager, Hensley Meulens, is the current hitting coach of the Giants. Hall of Famer Bert Blijleven meanwhile has also joined the staff as co-pitching coach. Sharlon Schoop, Gianison Boekhoudt and Juremi Profar were missing on the first day of training camp. Active MLB players will join the team later as well. The delegation will travel to South Korea on March 1, where they start against South Korea on March 7 into the 2017 WBC. Other first-round opponents will be Israel and Chinese Taipei.